Varanasi is quite the city to say the least. 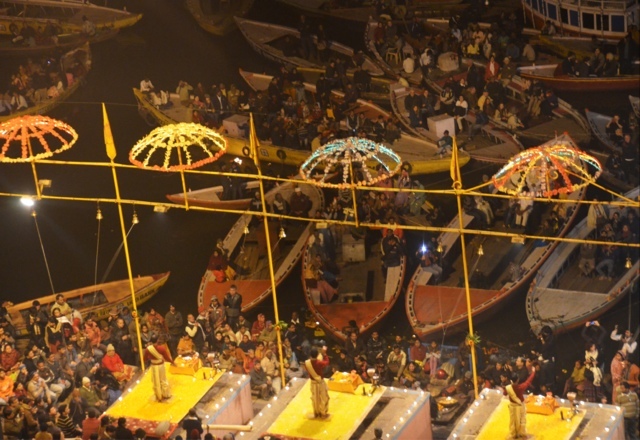 It is said to be the cultural capital of India and it is home to the "holy" Ganges River. Hindus view goddess Ganga as a fair complexioned beautiful woman wearing a white crown with a water lily and a water pot in her hands, and riding her pet crocodile. 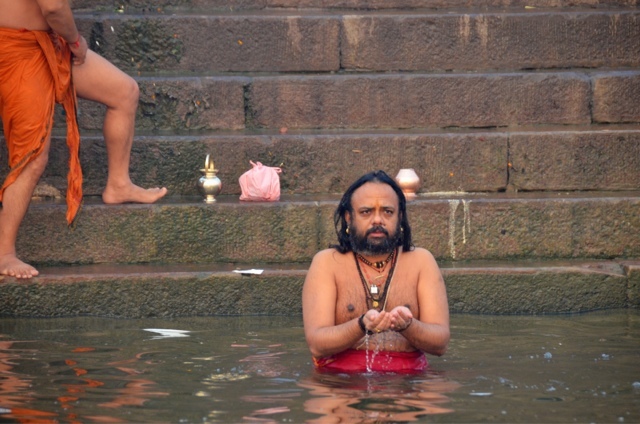 I also heard that she was created from the sweat of Lord Vishnu's feet.The belief is that bathing in the Ganges river can relieve a person of their sins, and that dying within a certain ancient and powerful area within the city (and having your ashes spread in the water) will end the cycle of reincarnation (obtaining moksha). It is also one of the oldest cities in the world. It is regarded as one of the seven pilgrimage sites for Hindus and also contains Sarnath, a nearby area where Buddha gave his first sermon. 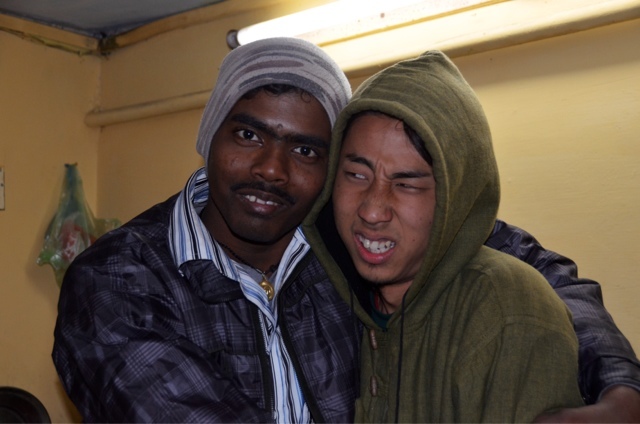 My partners in crime in Varanasi were Snoop Nihonjin, another Japanese guy that I will call "Hamlet," the kids at my hostel (half of the building was a hostel and half was their home), and several locals we picked up along the way. I didn't realize how much I missed Japanese people until I started hanging out with Snoop Nihonjin and Hamlet, whose Japanese characteristics and sounds (ehhhhhh, honto?) made me feel at home. I also resumed my role as an ego sensei, giving them daily English lessons. I told Hamlet, who knows very basic English, to get an English book so we could have more structure to our lessons. He returned with a proud smile on his face and Hamlet in his hands; a minor misunderstanding, bless his heart:) . My morning usually started off with a wake up call from men making bird calls on their roofs (in order to catch birds) followed by banana porridge and masala chai atop the roof of my hostel. 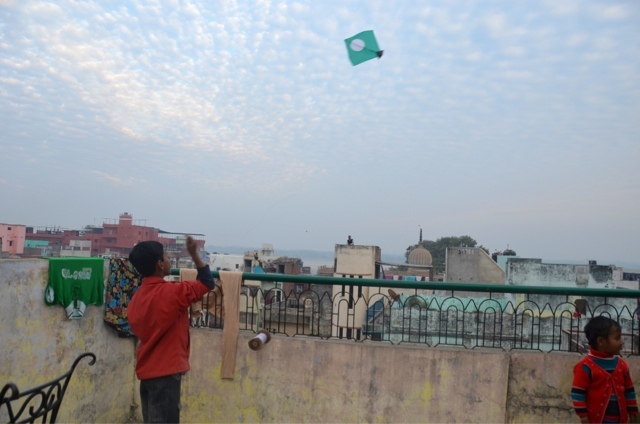 From there, I watched hundreds of kids fly paper kites, viewed heavyset men in their underwear scratch their bellies and gorgeous women clothed in saris do household chores. I would then put on my "I don't want to buy anything" game face and stroll down the ghats (steps leading down to the Ganges River) and avoid the incessant "madam madam, hello (followed by a variety of pitches to get money, the most popular being boat boat)." Along my stroll I would pick up a collection of friends, some wanted and some not. 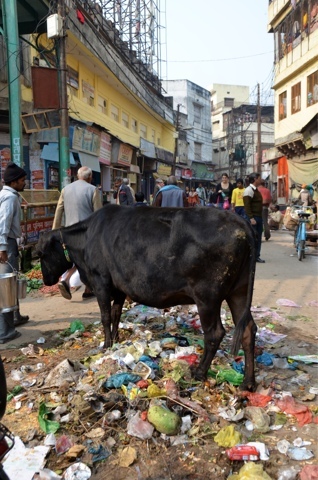 Most of the ghats smelled like public restrooms, were polka dotted with feces and were the home of hundreds of cows, monkeys, goats and mangy dogs. Besides the deification land mines, one had to be careful not to be clothe-lined by the hundreds of kids entranced in soaring their kites. One thing that was for certain when doing this walk, I never knew what I'd see or experience. Such as meeting many of the “sadhus” that stroll up and down the Ganges in their striking costumes, and I do mean costumes, as some of these are what you would call “tourist sadhus” who are dressed up for the "benefit" of tourist to get some easy income, while others are the real deal, with spiritual intentions. I even ran into a tourist sadhus's finger (yep, just walked right into it) and ended up with a red dot on my head...you don't run into a fake blessing every day. 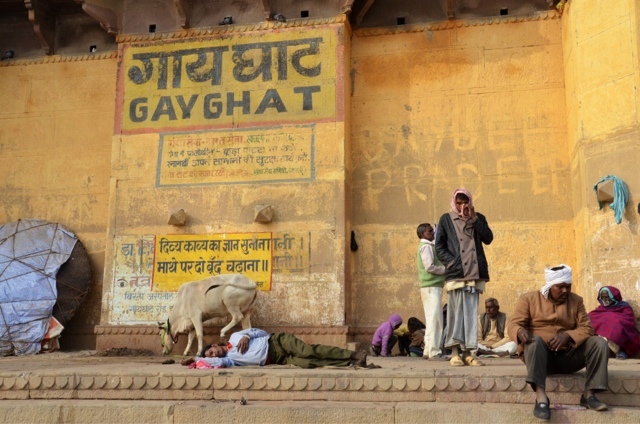 The ghats are not just communal baths, they're the Indian equivalent of the local pub. Watching ghats through the day is entertaining; they start to liven up before the sun rises, when those with early starting jobs mingle with the particularly pious in a morning scrub to wake up the senses and rub off the smell of a hard days work. Kids frolic in the river, playing games with the tourist boats while their mothers start on the clothes washing and old men consider how long it will be before they'll be floating down the river permanently. Come late evening the men start to drift back towards the river, now shaded from the sun by the buildings at the edge of the old city. Sitting on the steps with their portable stoves, the chai vendors make a killing as men come back from work. At this time many people take another dip to remove the scum layer gained during the day and kids flaunt their kite flying skills. Differences in standards for the sexes is apparent when observing the bathing divisions. Men can strip down to briefs that would make Brazilians do a double take, but the women have to bathe in full attire, showing nothing more than a bit of ankle and a strip round the waist. I watched women having full soapy baths without removing a stitch, slipping soap under the layers. I can't imagine having a bath with my clothes on, and I doubt Indian men can either. This shows the strength of the female spirit in India that, even during the morning wash, the women manage to retain their radiance and beauty to the shame of the dawdling and gangly men. 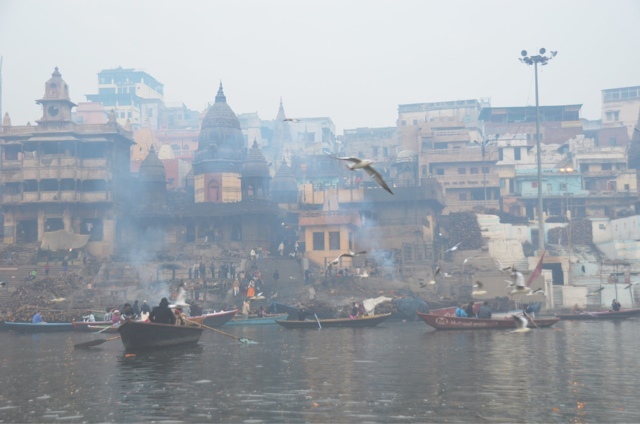 Varanasi isn't just a city with lots of ghats and temples, it's a seriously holy place, so holy that dying and having your body dumped in the Ganges here is so powerful that it's a guaranteed way of getting to heaven. This strikes me as one of the more bizarre aspects of Hinduism: if you can get to heaven simply by dying in Varanasi and making the correct arrangements, then why care about karma and caste and working hard all your life, why not just do whatever you want and make sure you die in Varanasi? Jalsain is the main burning ghat, this is where the bodies are brought in by relatives on stretchers, entirely covered in garish red and gold fabrics after being paraded through the city streets. 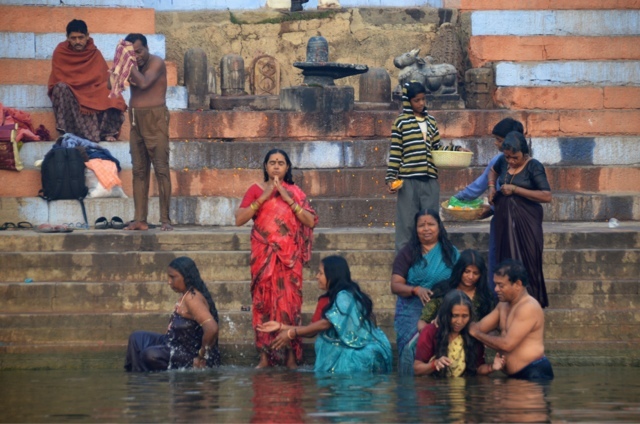 After the relatives wash the body in the Ganges for the last time (by dipping the covered body in the river), it is placed on top of an orderly pile of logs by the workers (untouchables; the lowest caste) who stack more logs on top before lighting the pyre. It doesn't take long for the fire to catch, and at any one time you can see two or three bodies burning steadily in the river breeze, giving off a smell disturbingly reminiscent of a barbecue. A typical body takes three to four hours to burn, but there's always something left: for a woman it's the hips, and for a man the lower back (don't ask me why), and these are just chucked into the river. The whole process is surprisingly efficient and almost un-Indian in its cleanliness. But there's a bit of Indian logic that makes all this cleanliness irrelevant. Not everyone is burned at the ghats, oh no. Holy cows, children less than twelve years old and pregnant women are not burned because they are pure and the whole point of the fire is to cleanse the soul on its way to heaven; instead they are just plopped into the river. Surrounding the continuous cremations, locals would gather around the bodies and on the observation decks. I also noticed children using the fabric previously covering the bodies as new toys, I guess it's easier to get ahold of than Tickle Me Elmo. The first time I observed this ritual was also the first time (within recent recollection) that made my blood boil. When I arrived at the cremation ghat I was herded up to a special observation deck where I could see the cremation from above. I was quite shocked, for it was the first time I had seen dead bodies in such an intimate setting. It didn't take but 30 seconds for the man that escorted me to ask for money. I didn't want to talk and I most certainly didn't want to support him using death as a business opportunity. I put in my headphones so he would leave me in peace to process what was happening before me. A mere minute later an old woman approached me (brought by the other man) and tried to give me a fake blessing so she could get a share of my wallet. I literally jumped back from her. I was not in the mood to converse with anyone and I was certainly not going to finance them. They cornered me and persisted with the best guilt trip they could muster. I was livid. They were completely insensitive to someone seeing mangled bodies being burned for the first time (besides in Nepal, where I didn't see any actual bodies) and my flight reflex kicked in; I ran. Making eye contact with lifeless faces melt into the fire was, for lack of a better word, heavy. The next few times I went to the burning ghat was much less emotional and I was able to handle basic interactions. 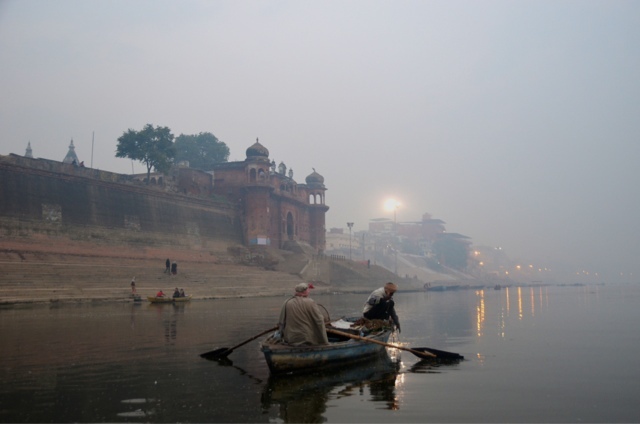 I decided to bring in the new year right, with a sunrise boat ride down the Ganges. Hamlet and Snoop Nihonjin decided to celebrate the new year and exercise hygienic-bravery by bathing in the Ganges. I, wanting nothing to do with that kind of "cleansing," opted to be their photographer. The streets were pure chaos. I did my best to weave through the herds of pedestrians, cows, goats, sheep, monkeys, angry dogs, auto and cycle rickshaws, food vendors, cars, motorcycles, all the while trying to avoid the feces and construction and not got lost in he maze of alleys. I was hesitant to test my immune system and try the street food but one can only resist the temptation of 20 cent delicious meals for so long (one day). I discovered the masala dosa, omelette with bread and chili potato mush and haven't regretted a single bite (yet). Small world moments: As I was walking home after sunset from the ghats I heard my name being called in an American accent... Pardon my acronym but WTF. Caught off guard, I turned around only to see none other than Nun-Chucks, whom I had met on my trek in the Himalayas. What are the chances? But that's not all... On my last day in Varanasi I ran into a friend from my hostel in Kathmandu (on his first day). Small world indeed. Math quiz: what does a freezing room+ cold showers + minimal blankets+ a Danika equal? A sniffling, coughing Danika. Spending a week and a half sleeping in a room where I could see my breath took it's toll (man, I miss heating). Although I had a single room, I ended up sharing it with a few others; my room mates were mice (dead and alive) and unknown bugs. 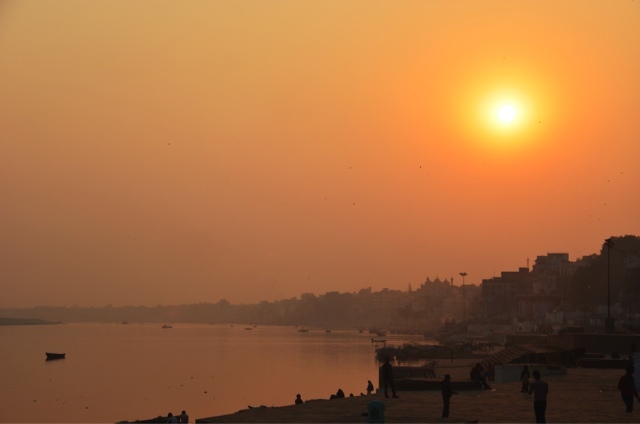 Despite having a few uninvited guests, and catching a cold, my hostel felt like home for the 2 weeks I was in Varanasi. I hung out with the 6 kids that shared the building with the hostel and with the goofy guy that ran the hostel every day; it was home. Between the hecticness and cow pies, it was a truly beautiful place, a place where no day was the same and that people's hopes were transparent. Aside from observing the colorful rituals near the Ganges, I escaped the madness in the greenery of a nearby University, explored Sarnath, relaxed in cafes and joked around with locals. It was hard to leave such an enigmatic place but a homestay in Orchha awaited my arrival.